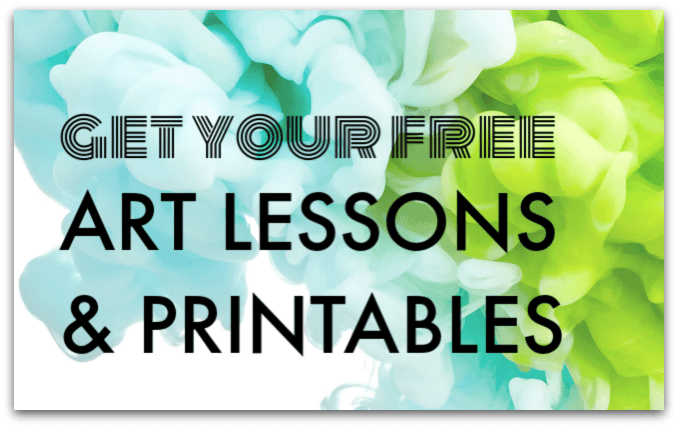 Join this famous art lesson for children to learn about the artist Janet Sobel. 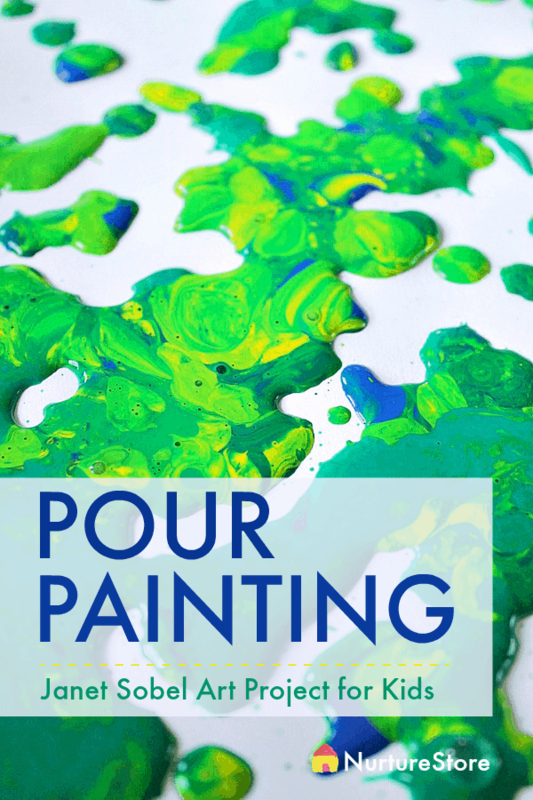 We’ll look at some of Sobel’s famous abstract expressionist paintings and make our own Janet Sobel inspired process art project using pour painting. Janet Sobel was a Ukrainian-American artist. She was born in 1893 and died in 1968. Sobel had no formal art education and began her career at age 45. Her work can be described as abstract expressionism. She often used music as inspiration, and she used art to depict her feelings. She would pour oil and enamel paint onto her canvass, and tip the canvass and blow the paint to move the paint around. She is considered to be the first person to have used the drip painting technique of Action Art, and her work directly influenced the paintings of Jackson Pollock. What words would you use to describe the artwork? What does the image make you think about? Let’s take inspiration from Janet Sobel’s pour paintings to create our own. 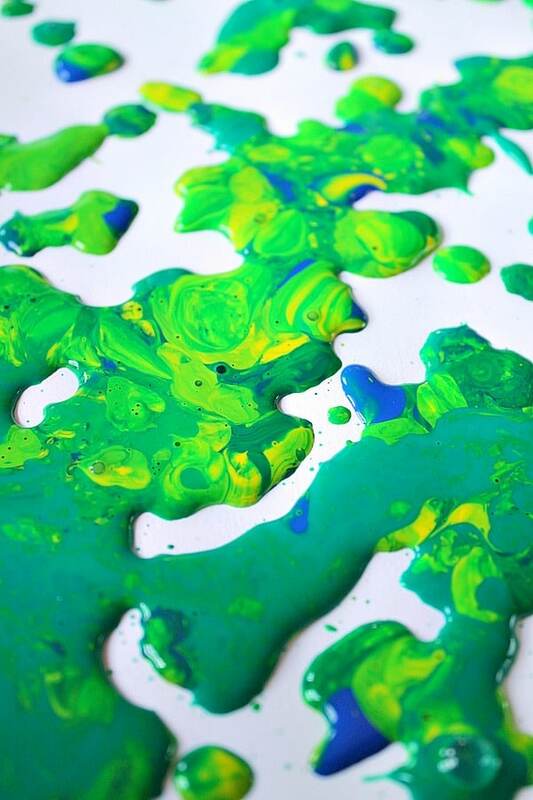 As there is movement involved and the flow of paint is subject to an element of chance, it’s certainly a good idea to make sure the surfaces surrounding your work are covered or otherwise easily cleaned. You might like to take this activity outdoors. Place a piece of paper or card down on a table or the floor, using a tray or dropcloth underneath to protect your work surface. 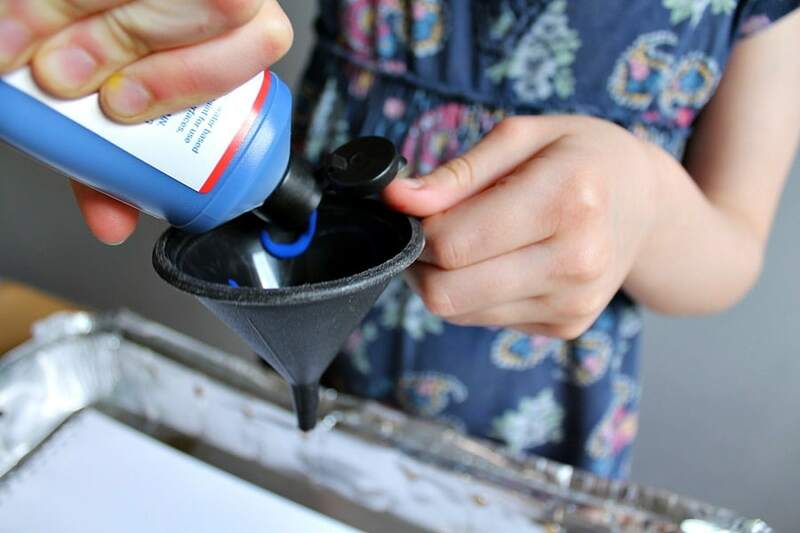 Gather your choice of paints and use squeeze bottles or pipettes to place the paint inside the funnel. Allow gravity to do its thing and let the paint pour out of the funnel and down onto your paper. You can move the funnel across your paper to create a design. 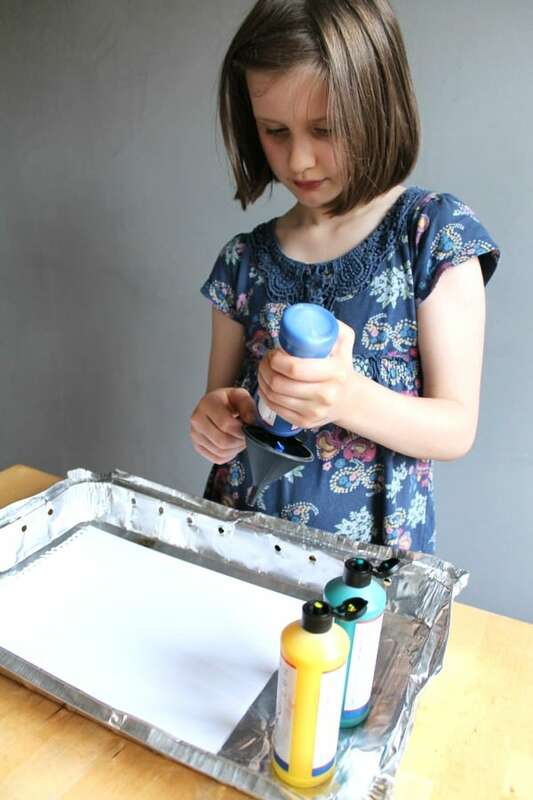 Experiment with different colours of paint and see what patterns you can create. 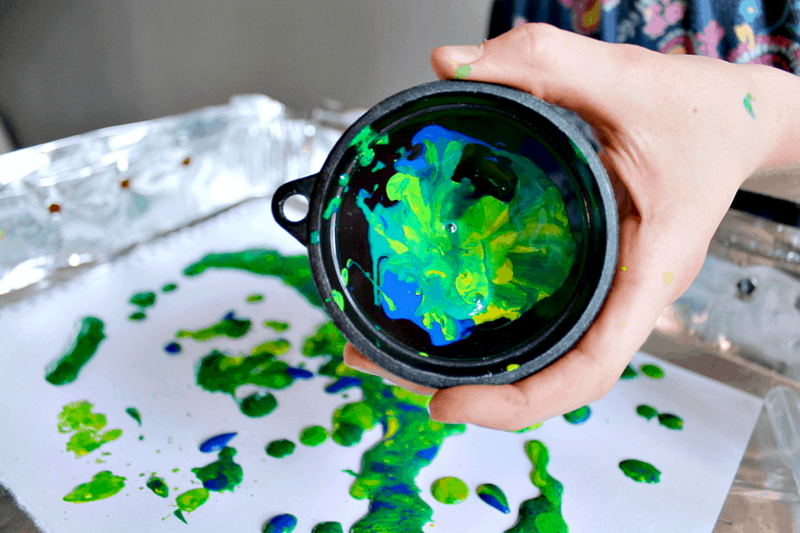 You can combine several different colours of paint at a time inside the funnel and see how they mix together as they flow down through the spout. You might need to add water to your paint to get it to flow through the funnel. You can test out different consistencies of paint to see how fast they flow through the funnel and which effect you like the best. You could try doing this with your eyes closed, moving the funnel across the paper randomly, and then only seeing the finished design when you open your eyes. If you enjoy working with the funnel, you can extend this art process by trying out a pendulum. Use a plastic drinks bottle, suspended upside down on a frame – perhaps a chair, or from a tepee made from garden poles. Cut the wide end off the bottle so you have an opening where you can put in the paint. The paint will then pour out through the neck of the bottle. Place a piece of paper, card or fabric under the bottle and frame, and swing the bottle from side to side, so it moves around on the strings. 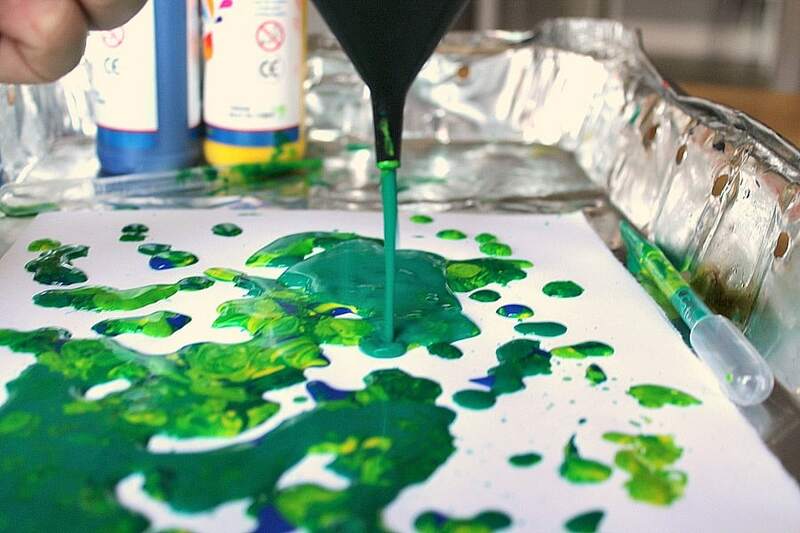 Watch the patterns the paint creates as it pours through the bottle on to your canvas. Or try swing painting. Head to the play park, or use your garden swing set, and place a roll of paper on the floor under the swing. Lie on your tummy, holding your paint brush, and paint on the paper as you swing backwards and forwards. Share your art with the NurtureStore community! We would love to see the art you create! Share a photograph on Instagram with the hashtag #ideasfromnurturestore and join our community gallery. Previous article: 100 days of school free printables and activitiesNext article: Printable bookmarks to color in – free Valentine printable!